In August 2016 we started the PCC (Planetary Community Chicken) Project thanks to the collaboration of Chido Govera and Koen Vanmechelen. Belgian artist Koen Vanmechelen first gained international recognition in the late nineties, with the launch of his Cosmopolitan Chicken Project (CCP). He began to cross-breed domesticated chickens from different countries with the ultimate aim of creating a truly Cosmopolitan Chicken. Over nearly two decades, this living artwork has produced over 20 generations of crossings, each more genetically diverse than the last. In August 2016, CCP chickens born at The Future of Hope Centre were presented at the National Gallery of Zimbabwe in a solo exhibition of Koen Vanmechelen, marking the beginning of the PCC in Zimbabwe. 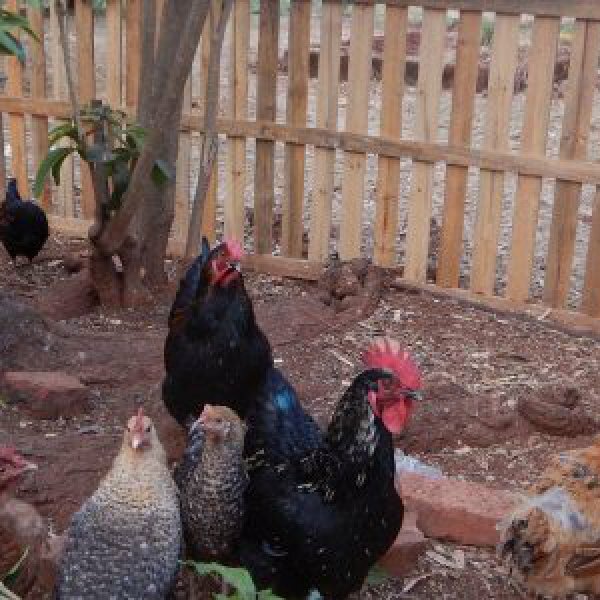 Native commercial chickens from Zimbabwe are now being crossed with CCP Roosters at The Future of Hope Centre in Christon Bank. By crossing the CCP with the local commercial chickens, the genetic diversity of the CCP is combined with the productivity and familiarity of the local bird to create a more resilient, adaptable and efficient chicken for the community. The PCC can be easily reared in different environments where The Future of Hope Foundation already works with mushrooms. The new strain brings an injection of fresh DNA to traditional chicken stocks that have become genetically impoverished through inbreeding and industrialization, and therefore more susceptible to disease. The PCC Project adds to the Foundation’s Mushroom Based Integrated Food Production System that is aimed at creating a possibility for communities to sustain their own eco-system more easily. The Mushroom Based Integrated Food System together with the chickens will create an opportunity to recycle nutrients as waste from the mushrooms and the garden by feeding it to the chickens which then provide the community with eggs and meat. This year, 2017 the foundation is working to prepare for the first PCC to go out to the communities in early 2018.